Duly Noted Painters is a team of artists consisting of Matthew Malone and Kurtis Ceppetelli working in collaboration on individual pieces simultaneously. Ceppetelli was born in Sudbury, Ontario, Canada. He studied painting and sculpture at NSCAD in Halifax Nova Scotia. Malone was born in Indiana, Pennsylvania. He studied painting and printmaking at Virginia Commonwealth University in Richmond, VA. 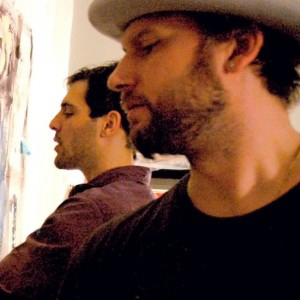 In 2009, the two painters met working at The Phillips Collection. There, the two decided to work on a piece together. What they soon discovered was a way to explore something new artistically. This resulted in a working partnership that to this day has produced over 70 large scale pieces over the course of two years. The duo has shown at various locations in Washington, Annapolis, and their most recent show attracted the attention of the East City Art Blog. Kurtis is a Museum Assistant. Matt is a former Museum Assistant. Are there any unique or interesting parts about your job that most people might not know about? Kurtis: I know all the hidden doorways. What is your favorite gallery space within The Phillips Collection? What would you like people to know about your art and process? The painting in the 2013 Staff Show is about a relationship both in subject matter and execution. We used a direct reference to another painting. As two artist working as one, our challenge is to make it ours. The result was not simply a reproduction of what we saw but how we saw it. Duly Noted Painters—“We are two painters painting as one.” Our work is just as much about the process as the painting itself. It is about compromise, discussion, feeling, mood, anger, love. It is experimental like our nature. Ultimately, the discussion is about what is best for the piece. This entry was posted in Experiment Station and tagged artist duo, artist pair, James McLaughlin Memorial Staff Show, John Graham, Richard Diebenkorn, staff show. Bookmark the permalink.